Home Theater Seating Blog CelebritySeating.com | Home theater seating, your best resource for home theater seating. Posted in See all theater seating blog posts | Comments Off on Connection between a Movie Studios decision and used theater seating supplies. So… guess what color outsells all others 10 to 1? Drum roll please…. Black. Yep. Black. Why? Well “black goes with everything”. This is so true. Black theater seats go with a red themed home theater, and green themed home theater, and a brown themed home theater… you get the idea. And what if 10 years from now the homeowner wants to change the color scheme of their home theater? 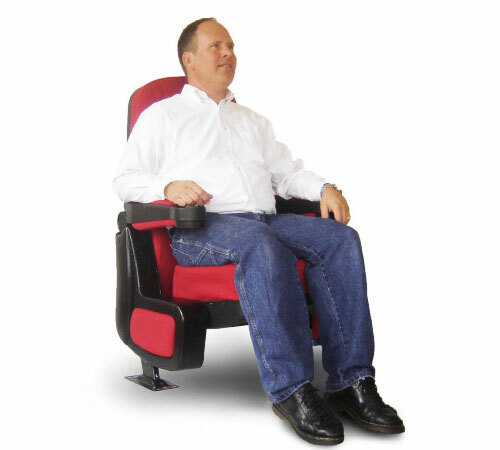 (Real theater chairs easily last up to 30 years.) Or if the home theater owners sell their house and the new owners are not crazy about that blue Avatar themed theater, well those black seats will look great in that ‘new’ home theater. What’s the second most favorite color? Red. A dark red, or ‘theater red’, as I call it. Plus many people buy their chairs by shopping online (Check out: http://www.CelebritySeating.com and http://www.WholesaleTheaterSeating.com ) and trying to pick a shade of green, or blue using your computer monitor is near impossible. So what to do? Buy black. Black is black. When you take your black chairs out of the box, guess what? That black will be exactly the color you imagined. Now with that all being said… there are several ways to put accents of color on your black chairs. You can wrap the theater chairs’ armrests with fabric, you can upholster end panels with fabric, and you can even put a fabric accent on the top of the chair’s back, as a headrest cover. These fabrics can contain the colors of your carpet, walls, etc. Tying in your chairs with the rest of the room. So there you have it. My two cents on chair color.